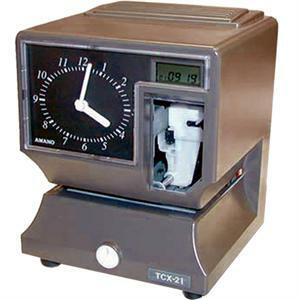 The Amano TCX-21 electronic time clock incorporates all the features of a standard electronic time recorder and adds the convenience of both an analog and digital time display. Additionally the large imprint window with illumination makes this clock a popular favorite for employers and employees alike. Automatic or manual print with choice of left or right hand print. Choice of 4 print languages (English, Spanish, French, or Portuguese). Automatic change for long and short months, leap year and Daylight Saving Times. Maintains correct time during power outages. Dimensions: 8.25" x 6.88" x 6.25"